Welcome to Elements of Oncology—a column that addresses the many components of diagnosing, managing, treating, and monitoring veterinary cancer patients. This new column begins with a series of two articles that describe strategies for cancer pain management in dogs and cats, with an overall goal of raising awareness among the veterinary community about treating cancer pain early and recognizing that cancer pain can be considerably different from other types of acute or chronic pain. Visit vetmedteam.com and take the continuing education quiz that accompanies this article to receive RACE-approved CE credit. Controlling cancer pain should always be part of a cancer treatment plan. Pain management should be implemented as soon as possible following diagnosis to address existing pain and prevent onset of new pain. Even if the patient has no outward, objective clinical signs of pain, the practitioner should assume that any tumor has the potential to cause subclinical pain, and pain management should be considered as part of the therapeutic plan. This is an important concept in the veterinary profession because our patients are unable to communicate their level of pain directly. Direct tumor invasion with compression of normal tissues. In addition, cancer pain can result from cancer therapies, such as surgery, radiation therapy, and cytotoxic chemotherapy. Optimal cancer pain management is determined by the type of cancer and the owner’s goals for treatment. The goal in definitive treatment is long-term control of the cancer and potentially long-term, pain-free survival; iatrogenic pain is to be expected as a consequence of definitive treatment. The goal in palliative treatment is to relieve cancer pain and slow, or minimize, the rate of cancer progression. 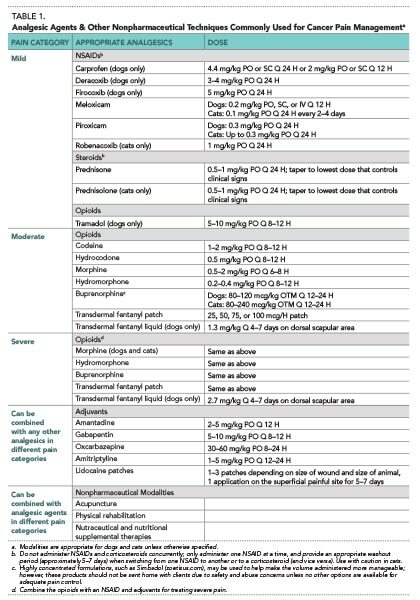 Table 1 lists pain medications discussed in this article, including dosing and frequency of administration. FIGURE 1. Goal-oriented cancer treatment decision-making tree. In humans, cancer pain management frequently includes nerve blocks, in which analgesic is injected into or around a nerve or into the spinal cord to block pain; nerves may also be transected surgically to relieve cancer pain.1 These modalities have not been used routinely in veterinary patients but may be worth exploring when other options are limited. For more information on nerve blocks in dogs and cat, read Surgical Skills: Local Anesthesia for the Distal Extremity (September/October 2014), available at tvpjournal.com. As noted, iatrogenic pain induced by definitive-intent treatments is to be expected. However, the cost of iatrogenic pain in these patients is outweighed by the benefit of longer-term survival. The pain management plan varies depending on the treatment modality used. Recent studies have called into question the analgesic effectiveness of tramadol in dogs.5 Tramadol’s analgesic effect for acute/traumatic pain may be minimal due to lack of metabolic activation of the metabolite (M1) that is needed for mu agonism. In addition, the nonopioid mechanisms of tramadol, including inhibition of serotonin and norepinephrine reuptake, may or may not exist in dogs and cats. Clinically, many cancer patients are geriatric and have comorbidities, such as renal disease, that preclude use of NSAIDs for mild to moderate pain. Therefore, options for at-home pain management are limited. Despite its shortcomings and questions about efficacy, tramadol is widely used due to its convenience, safety, and perceived long duration of action. Opioids or local anesthetics for regional anesthesia techniques, such as nerve blocks. Postoperative pain management is also similar, and frequently involves use of nonsteroidal anti-inflammatory drugs (NSAIDs) and other analgesics, such as opioids. Acute surgical pain management techniques have been reviewed extensively elsewhere and are not reviewed in detail here. However, see Consider This Case: Surgical Treatment of Osteosarcoma for a case presentation that demonstrates the use of definitive surgery to treat osteosarcoma. 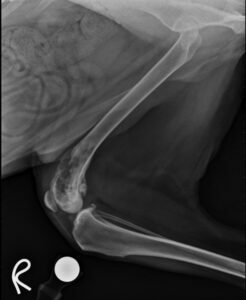 An 8-year-old, castrated male golden retriever presented for evaluation of a mass on the distal femur. Non–weight-bearing lameness was present and localized to the distal femur. Complete blood count and serum biochemical profile were within normal limits. However, craniocaudal and lateral radiographs revealed a moth-eaten-appearing, lytic region within the distal right femoral metaphysis (Figure 2). FIGURE 2. Right lateral radiograph of the stifle showing an aggressive, bony lesion in the distal femur. Note the area of focal bony lysis at the distal femoral metaphysis that has a moth-eaten appearance (*). Following amputation, the histologic diagnosis was fibroblastic osteosarcoma. Transdermal fentanyl liquid (2.7 mg/kg) was applied to the dorsal scapular area; the dog demonstrated mild sedation 2 hours later. Further premedication was achieved with acepromazine (0.01 mg/kg IM), with no other opioids needed to facilitate IV catheter placement. Maintained with isoflurane in oxygen with a circle breathing circuit. After IV induction, but before surgical incision, an epidural was administered using bupivacaine (0.5 mg/kg) with sterile saline. A coxofemoral disarticulation was then performed. Ketamine (0.5 mg/kg bolus injection followed by 1–2 mcg/kg/min IV CRI) and lidocaine (2 mg/kg IV bolus injection followed by 5–10 mcg/kg/min IV CRI) in crystalloid fluid were administered. Dexmedetomidine diluted in physiologic saline at 0.5 mcg/kg/H was administered as an IV CRI. Two lidocaine patches (5%) were applied to the surgical site after skin closure. The ketamine/lidocaine and dexmedetomidine CRIs were continued for 6 hours postoperatively. The preoperative transdermal fentanyl liquid, which yields 4 days of continuous analgesia, provided additional pain control. Gabapentin (10 mg/kg PO Q 12 H) for potential neuropathic pain. If pain is not controlled with the above medications, consider other opioids, such as OTM administration of buprenorphine (120 mcg/kg Q 24 H). 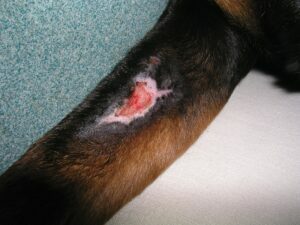 The dog was treated with chemotherapy (carboplatin, 300 mg/m2 IV Q 21 days for 4 treatments) beginning 10 days after skin sutures were removed. Five months after completion of carboplatin, thoracic radiographs revealed pulmonary nodules consistent with metastatic disease. The patient began doxorubicin chemotherapy and is currently undergoing treatment. Recently, a veterinary product with a higher concentration of buprenorphine (1.8 mg/mL; Simbadol, zoetisus.com) and a highly concentrated transdermal fentanyl liquid (50 mg/mL; Recuvyra, elancovet.com) have become available for treating pain in pets. Although these new, long duration, highly concentrated narcotics show promise, they must be administered and handled under the direct supervision of a veterinarian due to the potential for abuse and safety concerns. Oral transmucosal (OTM) buprenorphine at a dose of 80 to 120 mcg/kg (highly concentrated preparations, such as Simbadol, may make OTM administration more practical) is effective for analgesic durations of 12 to 24 hours in dogs and cats.6-7 We advise against sending this drug home with clients due to abuse concerns unless no other options are available for adequate pain control. Convenience of administration: One transdermal application provides 4 days of analgesia. The side effects of transdermal fentanyl liquid are similar to those of injectable fentanyl, including anorexia, sedation, hypothermia, and dysphoria. Our clinical experience suggests that respiratory depression and bradycardia are less frequent than with injectable fentanyl. Remember that once transdermal fentanyl liquid has been applied, its activity cannot be halted unless it is antagonized partially or completely using butorphanol or naloxone, respectively. To minimize risks when using transdermal fentanyl liquid as a premedication, other tranquilizers and sedatives should be avoided or administered at lower doses. Transdermal fentanyl liquid also has a propofol and inhalant sparing effect8 that should be considered during anesthesia induction and maintenance. For debilitated dogs, ½ to ¾ of the labelled dose may be applied rather than the full dose (2.7 mg/kg). Other opioids may be added if pain is under controlled. Hospital personnel and owners should be aware of the site of administration of transdermal fentanyl and avoid direct contact with it for 72 hours after application. Any contact with bare skin should be avoided and hand washing should be implemented should anyone touch the area of application before 72 hours. Distinguished by the large size of the total dose delivered and the small size of the dose given at each treatment session (called a fraction). Treatment is typically delivered Monday through Friday, with breaks on the weekend, for a total of 16 to 24 treatments, with fractions of 2 to 3 Gy, yielding a total dose of 48 to 60 Gy. A general understanding of the type of pain induced by definitive radiation treatment is important; Table 2 lists some common tumors treated with definitive radiation therapy and expected levels of pain associated with treatment. The target of radiation-induced damage is the DNA of rapidly proliferating cells, and the most significant side effects of radiation therapy are desquamation of the skin, mucositis, and keratoconjunctivitis sicca of the ocular adnexa. These side effects generally occur in treated areas around a cutaneous, oral, or nasal tumor. Acute side effects result from depletion of stem cells (such as keratinocytic stem cells in the skin) due to radiation damage. As radiation therapy progresses (usually 2 weeks into treatment course), acute side effects begin to appear as mild redness and dry, flaky skin in the treated area, which results from the inability of stem cells to adequately repopulate the keratinocytes that have naturally progressed through their life cycles and shed.11 As treatment and time continue, these effects become more severe (Figure 3). FIGURE 3. Moist desquamation after canine patient received 19 fractions of definitive radiation therapy for soft tissue sarcoma, excised with “dirty” margins from the distal forelimb. The limb is swollen, and several focal areas of redness and edema can be seen (A). One week after completion of definitive radiation therapy, the reaction has become more severe, with radiating redness, edema, crusting, and serum seepage (B). Two weeks after completion, note the near-complete resolution of moist desquamation; the skin is pink and smooth with a few areas of crusts and redness (C). Four weeks after completion, clinical signs have resolved completely (D). Acute side effects due to radiation are best managed proactively, with the knowledge that, although they may appear severe, their occurrence is transient and self-limiting. Cats are generally more resistant to acute side effects than dogs (Figure 4), and their side effects and discomfort tend to be less severe. FIGURE 4. Cat that has completed fraction 20/20 of definitive radiation therapy for a vaccine- associated sarcoma on the left paralumbar-flank region; dry, flaky skin is present with mild redness (A). Same cat 1 week after finishing definitive radiation therapy; note that dry, flaky redness has progressed and additional alopecia is present. No confluent moist desquamation is present as in the dog in Figure 3 (B). Same cat approximately 2 weeks after finishing definitive radiation therapy; lesions have healed and hair is beginning to grow back (C). This patient was prescribed OTM buprenorphine (80 mcg/kg), as needed. Clinical evidence of late effects includes fibrosis, stricture, necrosis and, potentially, a second cancer in the organs surrounding the irradiated area. Clinically significant late effects are irreversible and potentially life threatening, depending on their locations. It is important to counsel owners that lesions will heal if these recommendations are followed. As time and treatment progress, patients undergoing definitive radiation therapy require additional oral pain medications, such as tramadol, buprenorphine, gabapentin, and amantadine. OTM buprenorphine (80–120 mcg/kg Q 12–24 H) or transdermal fentanyl liquid (2.7 mg/kg, one application) can be used to further alleviate pain when NSAIDs and other analgesics do not provide enough comfort. FIGURE 5. A 7-year-old, spayed female rottweiler—previously treated for diffuse large B-cell lymphoma at another practice—presented due to relapse, with a nonhealing ulcer over the right cephalic vein. The ulcer had reportedly developed 7 months prior to presentation, following the first administration of vincristine. The referring veterinarian’s medical records indicated a change in the pet’s demeanor following the extravasation event, and the patient required a basket muzzle for subsequent treatments. The ulcer persisted until the dog’s death approximately 11 months after the extravasation event. Extravasation can be avoided by use of a perfectly placed, one-stick IV catheter and vigilant observation.15,16 To reduce the risk of inadvertent catheter dislodgment and extravasation in dogs and cats that are too excited for catheter placement with physical restraint alone, chemical restraint—such as a neuroleptic analgesic technique combining a sedative/tranquilizer (eg, acepromazine, midazolam, dexmedetomidine) with an opioid—should be considered. Use of the NSAID piroxicam has also been reported anecdotally,16 and other NSAIDs or opioids may be indicated depending on the severity and extent of tissue injury. NSAIDs and opioids may also be useful to reduce the occurrence of self-trauma following extravasation events that could lead to further local tissue injury. Although most recommendations for treatment of extravasation injury are anecdotal, it is prudent to manage cases of suspected or confirmed extravasation proactively, with combinations of topical dimethyl sulfoxide, cold compresses, NSAIDs, and opioids to reduce the risk for serious and potentially life-threatening tissue injury. Acrolein is a metabolite of cyclophosphamide that is concentrated in the urinary bladder and induces sterile hemorrhagic cystitis (SHC), a painful and irritating condition that manifests as hematuria, pollakiuria, and stranguria without evidence of a bacterial infection.17,18 When SHC occurs, cyclophosphamide is often discontinued to reduce the risk for worsening clinical signs. Providing large amounts of fresh water, and allowing frequent opportunities to empty the bladder. A similar reaction termed hand–foot skin reaction (HFSR) has been reported in humans following treatment with small molecule inhibitors, including sunitinib.19,24-25 HFSR is similar to HFS, but the lesions are histologically distinct and confined to pressure points. HFSR has not been reported in dogs treated with the small molecule inhibitors toceranib (an FDA-approved veterinary drug nearly identical in structure to sunitinib) or masitinib.26-29 As liposomal formulations of chemotherapy drugs and novel targeted chemotherapy agents become available in veterinary oncology, this side effect may be detected. Many veterinary patients with cancer are unable to receive definitive treatment; this may be due to metastatic disease at time of diagnosis, other life-limiting comorbidities, or lack of owner finances (Figure 1). The central focus of palliative treatment is relief of pain and suffering. Although most patients undergoing palliative treatment for their cancer will ultimately succumb to the disease, their quality of life can still be greatly improved for a period of time. Palliative treatment includes administration of pain medications and, potentially, various treatment modalities for the cancer itself. In certain clinical situations, cancer that causes discomfort and/or pain may require surgical palliation. It is important for the practitioner to think about the whole patient and disease process when considering this treatment modality as a method of palliation. The first dictum of palliative medicine is the overriding goal of decreasing the patient’s pain. In the osteosarcoma case, surgical amputation alone could be considered a palliative procedure; within 24 hours the patient felt better than it had prior to surgery. The distinction between palliation and definitive treatment in this case was the pursuit of chemotherapy, which created the potential for more side effects but improved long-term survival. Gilson provides an excellent review of the indications and pitfalls of surgical cancer palliation.30 Continuous pain management using NSAIDs, opioids, gabapentin, and amantadine is necessary in the postoperative period and may be needed for continued palliation when additional therapies are not pursued. What distinguishes palliative-intent from definitive-intent radiation therapy are goals of treatment, total dose of radiation delivered, and size of each fraction delivered. Palliative radiation therapy is designed to relieve clinical signs of pain and discomfort and avoid the potential for adverse side effects. In patients in which definitive surgery and radiation therapy are not possible, palliative radiation therapy should be considered. Patients with gross soft tissue sarcomas, mast cell tumors, histiocytic sarcomas, and nasal tumors are all viable candidates for palliative radiation therapy. Palliative radiation therapy is especially helpful for relieving pain that results from tumors that invade bone or other areas of the body. Pain sparing occurs as a result of the release of various anti-inflammatory cytokines at the treatment site, reduced osteolysis, and decreased tumor size.32 See Consider This Case: Palliative Radiation for Squamous Cell Carcinoma for a case presentation that demonstrates the use of palliative radiation. An 11-year-old, castrated male mixed-breed dog presented for evaluation of changes in mentation, anorexia, and mucohemorrhagic nasal discharge that had been occurring for the previous 3 months. On physical examination, the patient was noted to be circling, and manipulation of the head and nose elicited aggression. The patient had a pain score of 5/5 on the in-clinic scale (See Table 3, Part 1: Pathophysiology & Assessment of Cancer Pain, May/June 2015, available at tvpjournal.com). Computed tomography (CT) revealed a heterogeneous, contrast-enhancing mass in the nasal cavity, with destruction of the bones of the medial orbit. The mass invaded the cribriform plate and extended caudally for several centimeters into the forebrain, causing meningeal enhancement and lateral shifting of the falx cerebri (Figure 8). A biopsy of the mass was performed, and squamous cell carcinoma was diagnosed on histopathology. FIGURE 8. CT scans of a patient with nasal squamous cell carcinoma; note the extensive bony destruction and forebrain invasion. Axial postcontrast CT scan at the level of the cribriform plate and orbit; note the extensive lysis of the medial orbit (*) and lysis of the nasal turbinates (+) (A). Sagittal reconstruction; note the focal contrast enhancement in the forebrain (arrows), destruction of the cribriform plate (^), and invasion into the frontal sinus (#) (B). Palliative radiation therapy (4 weekly treatments with an 8-Gy fraction size) was prescribed, using IMRT to spare the eyes and brain. The patient also started receiving prednisone (0.5 mg/kg PO Q 24 H), OTM buprenorphine (120 mcg/kg Q 24 H), and gabapentin (10 mg/kg PO Q 12 H). When the patient returned 1 week later for the second dose of radiation therapy, the circling behavior had resolved and pain was no longer elicited when the face and head were touched. OTM buprenorphine was discontinued, and the patient was continued on gabapentin and prednisone for the duration of treatment. The patient was euthanized 3 months after finishing treatment due to acute progression of neurologic signs and seizures. Tumors with a favorable long-term prognosis and postoperative microscopic local disease, such as an incompletely resected low- to intermediate-grade soft tissue sarcoma of the distal limb, should never be treated with palliative protocols. Owners who cannot afford definitive therapy should be counseled regarding the probability of recurrence (relatively low) and advised to consider palliative radiation therapy or amputation at a later date should the tumor recur. While definitive treatments are delivered on a daily basis in 16 to 24 treatment sessions, palliative radiation therapy is delivered in 1 to 5 treatment sessions, either daily or once weekly. The fraction is also typically larger in palliative protocols, although the total dose delivered is smaller; definitive treatment fractions range from 2 to 3 Gy (total prescribed dose, 48–60 Gy), while palliative treatment fractions range from 4 to 8 Gy (total prescribed dose, 20–32 Gy). Higher total doses delivered over a longer period of time are more likely to result in acute side effects in the treated areas, such as mucositis, dry desquamation, and moist desquamation. Lower total doses delivered over a short period of time are less likely to result in acute side effects, while still delivering a high enough dose to have an effect on the tumor, including pain relief, reduced tumor size, and decreased mechanical stretching due to space-occupying masses. New techniques, such as IMRT, can be used to help minimize the potential for acute side effects in sensitive areas, such as the eye (see Nasal Tumors: Advanced Techniques Lead to Fewer Side Effects). Intensity-modulated radiation therapy (IMRT), an advanced treatment delivery system, shapes the radiation beam to nearly any complex shape (Figure 6). The highly conformed shape of the beam allows for sharp “falloff” at the borders of the dose, resulting in diminished occurrence or elimination of side effects, which is possible because the energy from the radiation treatment beam is focused on the tumor, avoiding organs with sensitive pain receptors, such as the skin and oral mucosa. FIGURE 6. Axial-slice computed tomography scans of the nasal cavity in 2 dogs receiving definitive radiation therapy for a nasal tumor. Red and yellow areas are receiving 100% of the prescribed dose; blue and green areas are receiving 50% of the prescribed dose. Three-dimensional conformal radiation therapy plan (A); IMRT plan (B). Note that the volume of normal tissue, such as the mandible and skin, receive a significantly reduced dose. 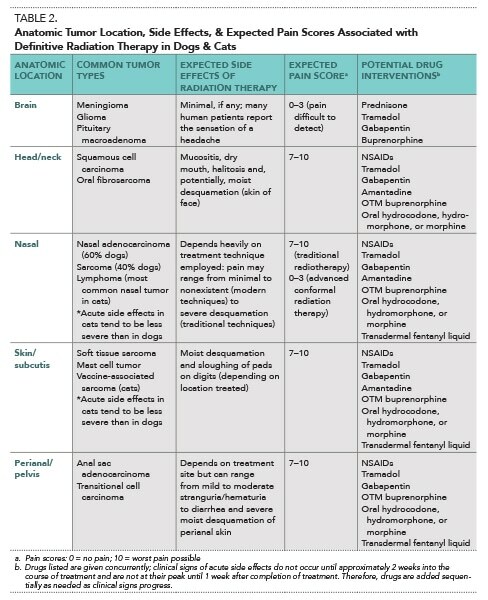 This advanced therapeutic modality is particularly important in treatment of nasal tumors, which are adjacent to critical structures, such as the eyes and brain, and limits common side effects, such as mucositis, moist desquamation, and keratoconjunctivitis sicca (Figure 7). FIGURE 7. Patient with nasal tumor one week after definitive radiation therapy (19 fractions) using 3-dimensional conformal radiation therapy plan; note the extensive area of radiating moist desquamation present on the medial canthus and lips and areas of redness and dry desquamation present on the dorsum of the nose and caudal to the eye over the frontal sinuses (A). Patient with nasal tumor one week after definitive radiation therapy using advanced, highly conformal, IMRT plan (19 fractions). Although significant moist desquamation is present, it is limited to a smaller area, radiating rostrally from the medial canthus (B). The patient in B only required NSAID pain medication during treatment, whereas the patient in A required multiple medications to manage painful side effects. Chemotherapy is frequently used with palliative intent in veterinary patients. Long-term successful outcomes are still possible when chemotherapy is administered with palliative intent, but a reduction in tumor volume or improvement in overall survival time may not be the ultimate goal. Reduce the rate of tumor growth, ultimately preventing potentially life-threatening tumor sequelae, as is often the case with transitional cell carcinoma. Cancer is a complex disease process that requires multimodal treatment, including surgery, radiation, chemotherapy, analgesics, and other nonpharmaceutical therapies. Pain can result not only from the cancer itself but also from the modalities that are employed to treat the cancer. Therefore, multimodal treatment should be used to manage cancer-related pain. As the demand for, and availability of, veterinary cancer care services increase, veterinary practitioners are likely to encounter many of the clinical scenarios outlined in this article. Veterinarians are also likely to encounter pet owners who are interested in pursuing therapy for pets diagnosed with cancer, which requires an understanding of what treatment options are available, when palliative versus definitive care is indicated, and how to manage pain caused by cancer or its treatment. Raslan AM, Burchiel KJ. Neurosurgical advances in cancer pain management. Curr Pain Headache Rep 2010; 14:477-482. Bray JP, Worley DR, Henderson RA, et al. Hemipelvectomy: Outcome in 84 dogs and 16 cats. A veterinary society of surgical oncology retrospective study. Vet Surg 2014; 43:27-37. Simpson AM, Ludwig LL, Newman SJ, et al. Evaluation of surgical margins required for complete excision of cutaneous mast cell tumors in dogs. JAVMA 2004; 224:236-240. Dernell WS, Withrow SJ, Kuntz CA, et al. Principles of treatment for soft tissue sarcoma. Clin Tech Small Anim Pract 1998; 13:59-64. Kogel B, Terlinden R, Schneider J. Characterisation of tramadol, morphine and tapentadol in an acute pain model in Beagle dogs. Vet Anaesth Analg 2014; 41:297-304. Abbo LA, Ko JC, Maxwell LK, et al. Pharmacokinetics of buprenorphine following intravenous and oral transmucosal administration in dogs. Vet Ther 2008; 9(2):83-93. Ko JC, Freeman LJ, Barletta M, et al. Efficacy of oral transmucosal and intravenous administration of buprenorphine before surgery for postoperative analgesia in dogs undergoing ovariohysterectomy. JAVMA 2011; 238(3):318-328. Grasso S, Ko JC, Paranjape V, et al. Effects of transdermal fentanyl solution administration on isoflurane minimum alveolar concentration (MAC) reduction at 4- and 24-hour after its application in dogs. ACVAA & IVECC Proc, 2014. Khan FM. The Physics of Radiation Therapy, 4th ed. Philadelphia: Lippincott Williams & Wilkins, 2010. Taylor LP. Mechanism of brain tumor headache. Headache 2014; 54:772-775. Hall EJ. Radiobiology for the Radiologist, 7th ed. Philadelphia: Wolters Kluwer Health/Lippincott Williams & Wilkins, 2012. Gillette EL, LaRue SM, Gillette SM. Normal tissue tolerance and management of radiation injury. Semin Vet Med Surg (Small Anim) 1995; 10:209-213. Gillette EL, Mahler PA, Powers BE, et al. Late radiation injury to muscle and peripheral nerves. Int J Radiat Oncol Biol Phys 1995; 31:1309-1318. King JN, Hotz R, Reagan EL, et al. Safety of oral robenacoxib in the cat. J Vet Pharmacol Ther 2012; 35(3):290-300. Thamm DH, Vail DM. Aftershocks of cancer chemotherapy: Managing adverse effects. JAAHA 2007; 43:1-7. Venable RO, Saba CF, Endicott MM, et al. 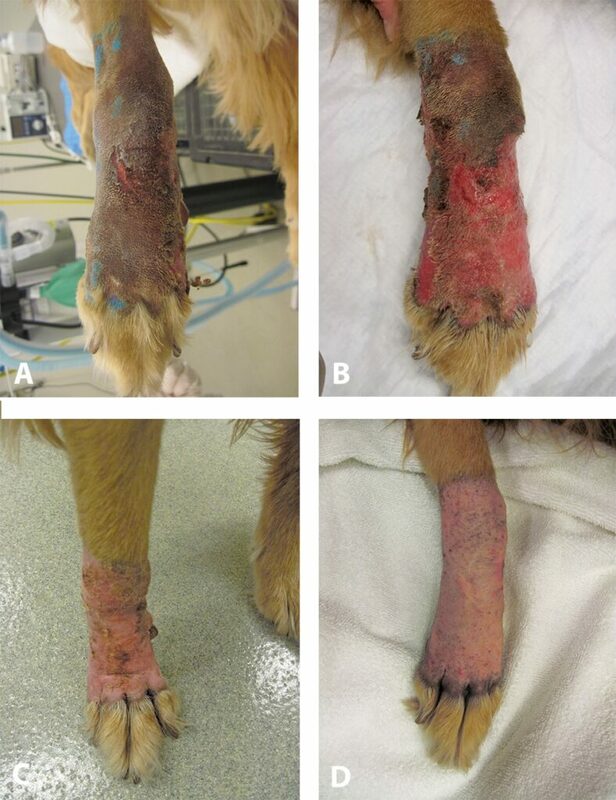 Dexrazoxane treatment of doxorubicin extravasation injury in four dogs. JAVMA 2012; 240:304-307. Charney SC, Bergman PJ, Hohenhaus AE, et al. Risk factors for sterile hemorrhagic cystitis in dogs with lymphoma receiving cyclophosphamide with or without concurrent administration of furosemide: 216 cases (1990-1996). JAVMA 2003; 222:1388-1393. Best MP, Fry DR. Incidence of sterile hemorrhagic cystitis in dogs receiving cyclophosphamide orally for three days without concurrent furosemide as part of a chemotherapeutic treatment for lymphoma: 57 cases (2007-2012). JAVMA 2013; 243:1025-1029. Miller KK, Gorcey L, McLellan BN. Chemotherapy-induced hand-foot syndrome and nail changes: A review of clinical presentation, etiology, pathogenesis, and management. J Am Acad Dermatol 2014; 71:787-794. Anderson RT, Keating KN, Doll HA, et al. The hand-foot skin reaction and quality of life questionnaire: An assessment tool for oncology. Oncologist 2015; 20:831-838. Vail DM, Kravis LD, Cooley AJ, et al. Preclinical trial of doxorubicin entrapped in sterically stabilized liposomes in dogs with spontaneously arising malignant tumors. Cancer Chemother Pharmacol 1997; 39:410-416. Teske E, Rutteman GR, Kirpenstein J, et al. A randomized controlled study into the efficacy and toxicity of pegylated liposome encapsulated doxorubicin as an adjuvant therapy in dogs with splenic haemangiosarcoma. Vet Comp Oncol 2011; 9:283-289. Vail DM, Chun R, Thamm DH, et al. Efficacy of pyridoxine to ameliorate the cutaneous toxicity associated with doxorubicin containing pegylated (Stealth) liposomes: A randomized, double-blind clinical trial using a canine model. Clin Cancer Res 1998; 4:1567-1571. Anderson R, Jatoi A, Robert C, et al. Search for evidence-based approaches for the prevention and palliation of hand-foot skin reaction (HFSR) caused by the multikinase inhibitors (MKIs). Oncologist 2009; 14:291-302. Lacouture ME, Reilly LM, Gerami P, et al. Hand foot skin reaction in cancer patients treated with the multikinase inhibitors sorafenib and sunitinib. Ann Oncol 2008; 19:1955-1961. London CA, Hannah AL, Zadovoskaya R, et al. Phase I dose-escalating study of SU11654, a small molecule receptor tyrosine kinase inhibitor, in dogs with spontaneous malignancies. Clin Cancer Res 2003; 9:2755-2768. Bernabe LF, Portela R, Nguyen S, et al. Evaluation of the adverse event profile and pharmacodynamics of toceranib phosphate administered to dogs with solid tumors at doses below the maximum tolerated dose. BMC Vet Res 2013; 9:190. Hahn KA, Ogilvie G, Oglivie G, et al. Masitinib is safe and effective for the treatment of canine mast cell tumors. J Vet Intern Med 2008; 22:1301-1309. Smrkovski OA, Essick L, Rohrbach BW, et al. Masitinib mesylate for metastatic and non-resectable canine cutaneous mast cell tumours. Vet Comp Oncol 2013. Gilson SD. Principles of surgery for cancer palliation and treatment of metastases. Clin Tech Small Anim Pract 1998; 13:65-69. Lawrence JA, Forrest LJ, Turek MM, et al. Proof of principle ocular sparing in dogs with sinonasal tumors treated with intensity modulated radiation therapy. Vet Radiol Ultrasound 2010; 51(5):561-570. Goblirsch M, Mathews W, Lynch C, et al. Radiation treatment decreases bone cancer pain, osteolysis and tumor size. Radiat Res 2004; 161:228-234. Fan TM, Charney SC, de Lorimier LP, et al. 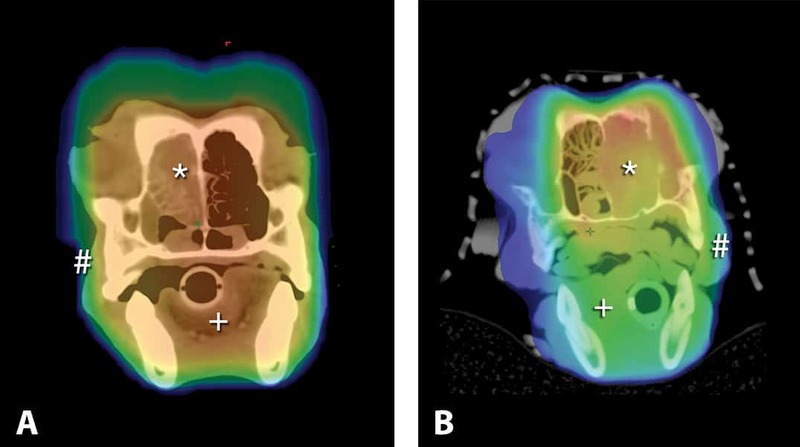 Double-blind placebo-controlled trial of adjuvant pamidronate with palliative radiotherapy and intravenous doxorubicin for canine appendicular osteosarcoma bone pain. J Vet Intern Med 2009; 23:152-160. Nicholas Rancilio, DVM, Diplomate ACVR (Radiation Oncology), is a clinical assistant professor at Purdue University College of Veterinary Medicine. He received his DVM from Michigan State University, completed a small animal rotating internship at Washington State University, and completed a residency in veterinary radiation oncology at Purdue University. His interests include oncology patient palliative and hospice care, as well as image guided radiation therapy and stereotactic body radiotherapy. Jeff Ko, DVM, MS, Diplomate ACVAA, is a professor of anesthesiology at Purdue University College of Veterinary Medicine, and is an anesthesiologist at Purdue Veterinary Teaching Hospital. He has taught anesthesiology at Virginia Tech, University of Florida, and Oklahoma State University. Dr. Ko has authored over 100 refereed articles and has recently published the book, Small Animal Anesthesia and Pain Management: A Color Handbook. Christopher M. Fulkerson, DVM, MS, Diplomate ACVIM (Oncology), is a clinical assistant professor of veterinary medical oncology at Purdue University College of Veterinary Medicine. He received his DVM and MS degrees from Purdue University, completed a small animal rotating internship at Texas A&M University, and completed a residency in veterinary medical oncology at Purdue University.